Last month had us talking about Quantronic Superiority, but now let’s talk about Air Superiority! 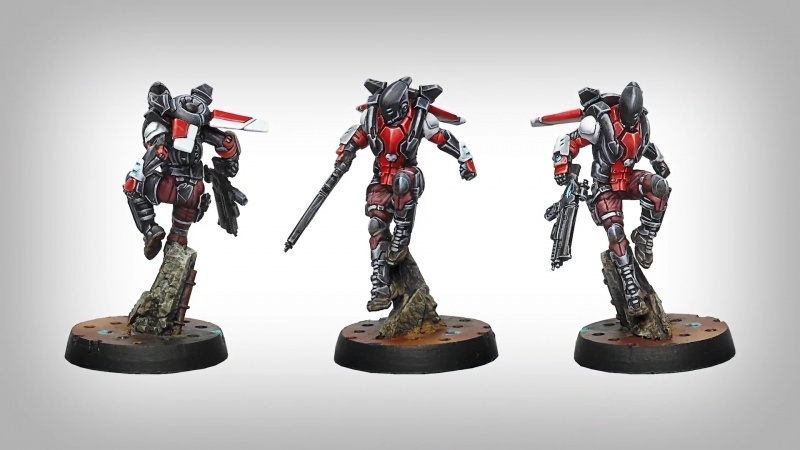 Nomads have access to some of the best airborne troops in the game, even considering the Yu Jing Tiger Soldier and Liu Xing troops. Until the release of the Hakims, Tomcats had a monopoly on AD doctors, and we still have a monopoly on AD engineers. 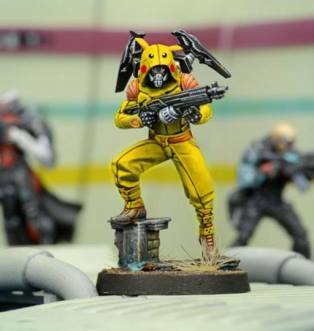 We have access to Hellcats and all of their amazing kit, and two of our factions (Tunguska and StarCo) can get Raoul in his Pikachu onesie (not sure who to give credit for the image to). 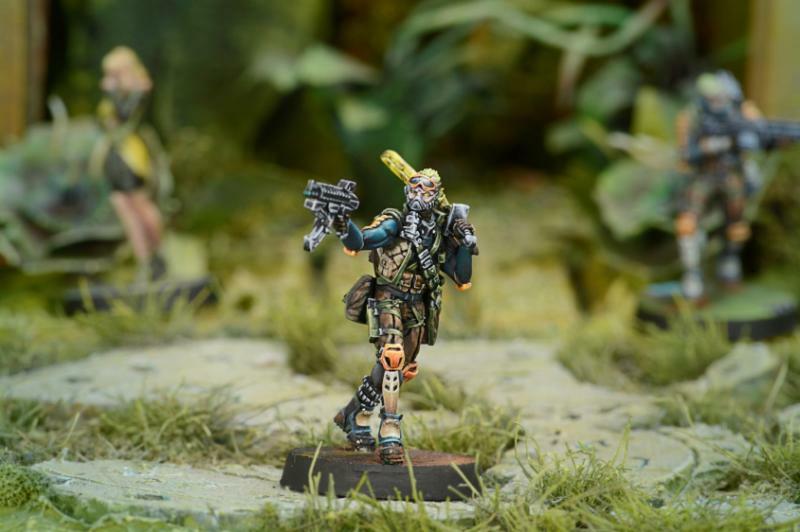 Get some games in with Airborne Deployment troops this month. 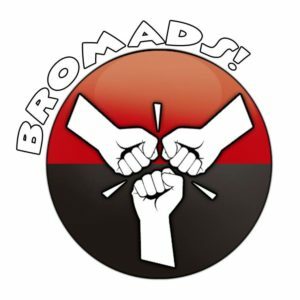 Write in about how it all went to report@bromadacademy.com and be entered into a drawing to win a blister and some hacking tokens! As always, StarCo counts! Now get out there and make it rain men (and women)! Let’s briefly discuss the options available to Nomads. I’ll lump Carlota in with the Tomcats for simplicity. I’m also going to start by discussing Tomcats. Tomcats are a great Nomad staple, and one of the troopers that often are the subject of other factions’ envy. They basically all have the option of choosing AD:2 or Zero-G, the latter only really being relevant on tables with that terrain type which disallow Airborne Deployment. AD:2 means they can come on the table using any board edge that isn’t your opponent’s deployment zone or an exclusion zone. AD:2 alone is great, but Tomcats also have the additional skill of Climbing+, which gives them a truly terrifying amount of mobility. The base Tomcat profile comes with a combi rifle and light flamethrower, which lets you threaten everything from cheerleaders to multi-wound models with visibility mods. Tomcats also often gain kill marks in groups of five from roasting clumped link teams that overextended themselves in an early attack run. Climbing+ will let you get to where you need to be to land that template or get that back-arc shot on an enemy lieutenant. There are three specialist profiles: the Doctor, the Engineer, and Carlota (who is also an Engineer). You can pay a few extra points to get a Zondcat (or Moriarty in Carlota’s case), which is basically an AD:2 helper REM. If you want a competent gunfighter specialist, look no further. Tomcat Doctors have a long and storied history of picking up McMurrough on a board edge, and the same can be said for Tomcat Engineers and the plethora of Nomad attack REMs and TAGs. The Zondcats, like the Hakim’s Nasmat A2s, are an interesting addition to the Tomcat’s toolkit. Since they must deploy with the Tomcat in the same table section, their board coverage is severely hampered. Still, you can use them to help your Tomcat pick up multiple downed models in an efficient manner, threaten Electric Pulse attacks, force AROs, or get burst two D-Charges on the Tomcat Engineer profiles. I personally find that the Zondcat is the first thing to go when I’m hunting for points to cut in a list, but they do have their uses. Carlota is a better Tomcat Engineer, but you pay for it. The key addition, besides the stat bump, is her ADHL. That alone is often worth the point increase, as it lets you threaten things like TAGs at range. BS13 does not make her invincible though, so be careful of your angles. As for the non-specialist profiles, you can choose to get a DEP or a Deployable Repeater, should you need that in your list. The one significant departure from the Tomcat’s normal kit is the E/Mitter and Antipersonnel Mines profile, which is quite unique. The E/Mitter replaces the light flamethrower, which at first glance looks like a loss, but the power of EM2 ammo is not to be discounted. Plenty of TAGs have advanced up the board only to become entirely useless, thanks to this simple rifle attachment. The real gem of this profile is the ability to bring mines into the enemy deployment zone cheaply and reliably. You can tie up enemy link teams, shape their movement, or just drain orders with this profile. I strongly recommend you give it a go, especially in Corregidor where it’s a rare source of mines. 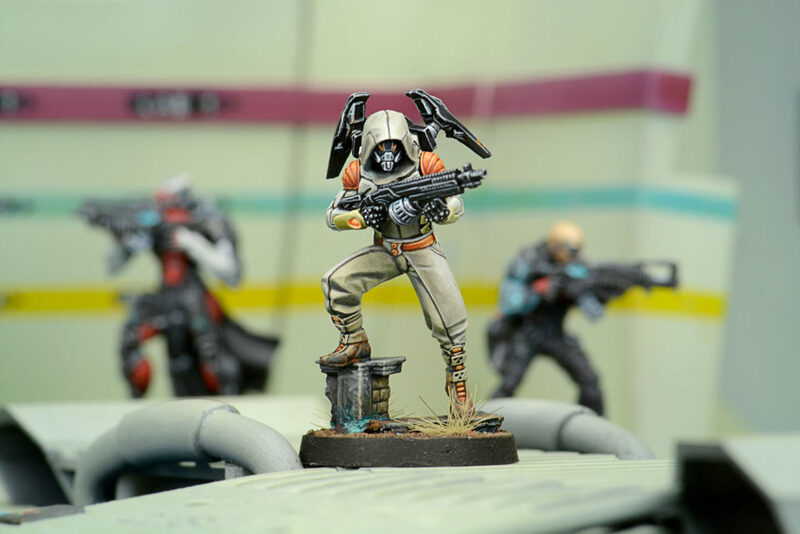 TheDiceAbide has a nice article on Cube Jagers. He does a good job of covering the basics of the profile. That said, when the Cube Jager first came out, most Nomad players looked at it, scoffed, and kept using their Tomcat Doctors. I’m here to suggest to you that you might want to have another look, especially at the SMG profile. If you want a Boarding Shotgun, grab a Hellcat. It can get exactly where you need it to be, thanks to AD:5, and is a more competent gunfighter. The Cube Jager SMG though, is a pretty interesting addition to the Nomad toolkit. With all the NWI and heavy infantry running around these days, the importance of having shock and AP ammo on target in an efficient manner has increased. The same goes from E/M ammo in the form of the E/Mitter. I think of the Cube Jager SMG as different Tomcat Doctor. It’s less effective at some things, is less mobile, but has some useful kit the ability to deploy it in much the same way as the Tomcat Doctor. It’s not going to replace our beloved Tomcats in every list, but sometimes when you only have one slot left in a combat group and you’re looking for an AD specialist, the ability to bring shock, AP, and EM2 ammo to the table in one neat package might make you choose the Cube Jager over the Tomcat Doctor. The loss of Climbing+ and fire ammo is significant, it’s true, but it’s a trade-off well worth considering. Ah, the Hellcat, proud recipient of Airborne Deployment, Level 5. AD:5 isn’t often relevant–basically if you disperse and would land off the table, in impassible terrain, or in your opponent’s deployment zone, instead of deploying on a table edge in your DZ, you get to choose where to land in your DZ–but when it happens it can save your Hellcat. 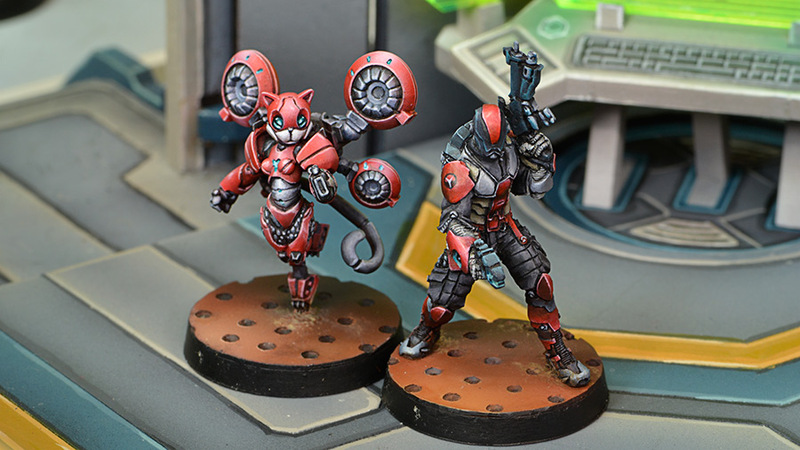 I’m a big proponent of the philosophy that there are no bad profiles in Infinity, but for the life of me I can’t really find something nice to say about the Hellcat Lieutenant profile. Don’t take it, unless you want to practice being in Loss of Lieutenant (honestly not a terrible idea). Every other Hellcat profile, however, has a place. The Paramedic profile is not often used, but is a cheap, SWC-less specialist. You’ll often see the Boarding Shotgun Hellcat, because who doesn’t want the ability to land a Boarding Shotgun right behind that link team or lieutenant? If you can’t afford Carlota, the ADHL Hellcat is a good combi-toting rambo piece that can threaten every type of hostile trooper, and if you want to build your repeater network, the Hellcat DepRep is a good option as well. The big debate, though, is centered around the Spitfire and HMG profiles. Many people seem to prefer the Spitfire, and for good reason! If you’re bringing a Hellcat onto the table by walking it on or even jumping it in, the chances are you’ll be engaging things within 16″, where the Spitfire has a clear advantage over the HMG in terms of range bands. If that’s how you use your Hellcats, i.e. on the enemy side of the table, then the Spitfire won’t let you down. I’d like to make a case for the HMG Hellcat though. 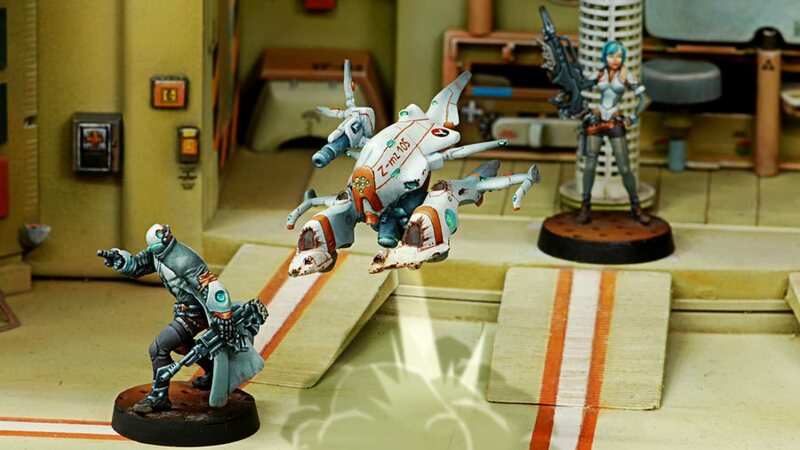 One, the Model is awesome, which should be enough to convince anyone (yes the Spitfire one is rad too). The real value add, however, is the ability to get a HMG wherever you need it in one order. Think of it as a super-flanker. You can walk it on the left table edge, and threaten the unguarded flanks of things all the way on the right side of the table edge. You can even walk it into your deployment zone, to shore up a weak side or to surprise your opponent with an HMG where there was none before. The E/Mauler is just gravy, though. E/M weapons are becoming more and more important in the current global meta with the rise of Invincible Army and TAK (you can’t isolate Vet Kazaks but you can turn them into expensive, otherwise useless cheerleaders). It’s at odds with the HMG’s rangebands, but don’t be afraid to drop the Hellcat into the enemy’s deployment zone, drop an E/Mauler, and then go into suppression to negate your rangeband disadvantage. Food for thought. The Meteor Zond is an odd duck. It’s basically a Stempler with Airborne Deployment and a 1 SWC tax. That may sound unappealing, especially with the 6-4 MOV of the speedy Stempler, but the power of a buffed combi rifle appearing on an unguarded flank can’t be understated. You can set up all sorts of dirty tricks: unexpected Triangulated Fire, Sat Lock shenanigans, sensor-ing that pile of TAK camo tokens, or just being a repeater where the enemy really doesn’t want one. Raoul has been the subject of much discussion and hype on the internet. He’s pretty fantastic. He’s our only “multi-wound” AD model in Nomads, which lets you be more aggressive than you might ordinarily be when dropping him in, and he comes with Mimetism. If you want to be reductionist about it, Raoul is a significantly upgraded Hellcat BSG. Continuing that line of reasoning, one might consider dropping Raoul for a Hellcat BSG to save points in a StarCo list, which is a valid option. For Tunguska players though, Raoul and the Meteor are all you’ve got. Raoul is a pretty straightforward tool to use. You drop him in where you think you need some stuff dead, and let him do his thing. He can threaten just about anything with his boarding shotgun and E/M2 escrima sticks, and is likely to make it happen thanks to NWI and NBW. You don’t have enough movement to move and then shoot at something from cover, so you’re forced to move and then throw away your second short skill instead of granting the enemy a normal roll shot at you. Move into LoF (hopefully still in cover), and blast away. At the time when Raoul came out, I was playing a bunch of 10-order lists, so order #2 above just felt awful. With Raoul, the second short skill of order #2 is now “throw drop bear,” which elegantly solves the efficiency issue and dramatically increases the threat to the enemy. Infinity is a game of positioning, and AD troops let you get the position you want generally in one order. Now get out there and drop some of the Nomad Nations finest on your enemies’ heads!